Posted November 10, 2013 at 1:32 pm . 39 comments. Amazing deal. B&H Photo Video matched the deal on the Canon EF 70-200mm f/2.8L IS USM II: they have it for $1899.00 (after a $300 mail-in rebate). The discount shows up at checkout. They’re also giving a 4% reward. Your net ends up around $1811. This is the cheapest price we’ve ever seen for this lens. This price will not last long at all. UPDATE: Adorama has now matched this deal. Double-dip deals are ones where the stores discount by the amount of the mail-in rebate (in this case, $300), effectively doubling the value. B&H is one of the best camera retailers around and is obviously eligible for the $300 rebate. Start checkout to see this deal. Thank you CanonPriceWatch for the alert, I ordered on Nov. 10 and received the len when it was 4% reward. Now it has only 2% reward. The rebate form says “Limit 1 Claim per lens per household”, which suggests you can make multiple claims as long as they are not for the same lens. so we could do two separate rebates for two different lens? I’ve already done the 24 70 rebates, and got approved. That’s my understanding, and what the rebate people said when I called to ask. As long as they are different lenses. If you want to be absolutely certain you can call the rebate company tomorrow morning. I’m not sure if this price will still be around though, so you may want to order first. Great deal. Cheaper than when I bought mine two years ago for $1969. Are Canadians enligible for mail in rebate? What happen to the good o days with no rebate at this price. Canons markup is rediculous. Agreed. In those “good o days”, the low prices were in place because of “instant rebates”, which needed to be done by the stores. Retailers hated them, because of the paperwork, complications, fear of getting rejected (do the reasons sound familiar?). I placed order with Bugdig using my Discover card (5% cash back online shopping. up to $75). Then BH has 4% rebate, so canceled the order, placed with BH, it’s about $170 additional saving. Thank you! How did u cancel the Buydig order? I called Buydig for the cancellation. Then a cancellation confirmation email arrived. It’s not been posted on ebay yet. Thank man. I just followed your lead. Any idea when they will refund us (Assuming that you paid through PayPal too on the BuyDig order)? So glad I found this site and signed up! Finally picked up this lens after stalking for months. Thanks! Good call! Yes, B&H has been matching most of the double-dips. I say most, because last week’s 100L Macro double-dip (down to $749) wasn’t matched by anyone. I know a lot of people were waiting for it to be. Smart you! It took me a lot time to have this finally settled with BH. It’s well worth the effort though — 4% B&H reward. B&H delivered in 2 days even with standard shipping. Used it today in my son’s basketball game. What an awesome lens. It is quite hefty but I had no problem handholding it. 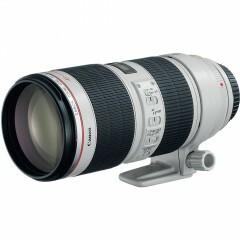 Is this a worthwhile upgrade of the 70-300L? Having used both, I’d say so — the IQ is incomparable and the constant aperture f/2.8 is fantastic. The only downsides are losing 100mm of reach and the 70-200L is a bit bulkier/heavier. Thanks for the quick response. Will have see how much I could get for the 70-300 and if the difference is worth it. You seeing this Jennifer King? Sweeet lens, unfortunately I purchased a couple years ago at a much higher price, but the only unfortunate part was the price, because lens is Greeaaat. The same deal at BuyDig eBay just expired; it is likely that this one will expire soon as well. Adorama matched this deal too, but no sign of Amazon, yet. Been watching this lens for months and considering the Tamron instead. With this double-dip discount I could justify springing for the real deal — thanks CPW! Got my 70-200 from B&H. Very fast delivery. Still wondering about the 4% reward. Haven’t seen it mentioned anywhere. Great! You get a notice about the 4% reward credit in about 40 days. They have now reduced the reward to 2%. Noticed that — interesting, Adorama has followed as well.